Scouts dance to YMCA in front of the QBSA, the national jamboree's official radio station since 1997. BSA photo by Al Drago. "We are the soundtrack of the jamboree," says Michael J. Thorp, chairman, general manager and program director of QBSA Jamboree Radio.Thorp, who has been a radio program director outside of Scouting for 40 years, organizes QBSA's daily programs. "We give each Scout who wants to be on the air a 15-minute show," says Thorp. Througout the jamboree, Scouts and Venturers have enjoyed the opportunity to host a 15-minute show after a 30-minute class on what to report and how to run their show. "You've got to say the call letters, you have to do these kind of things, you add [programs] around that and that's what we teach these kids what we're doing," says Thorp. QBSA features the same large library of all types of music that you might hear on any radio station at home. Scouts and Venturers reported the weather, read public service announcements, interviewed people around the Summit Bechtel Reserve and some read sports stories and scores. A professional radio team of Scouters was on the air 5-9 a.m., then jamboree participants controlled the airwaves from 9 a.m. to 7-8 p.m., depending on the day. QBSA 98.3 FM replaced WBSA at the start of the 1997 National Scout Jamboree. In 2005, QBSA began streaming over the Internet and this continued during the 2005 jamboree. 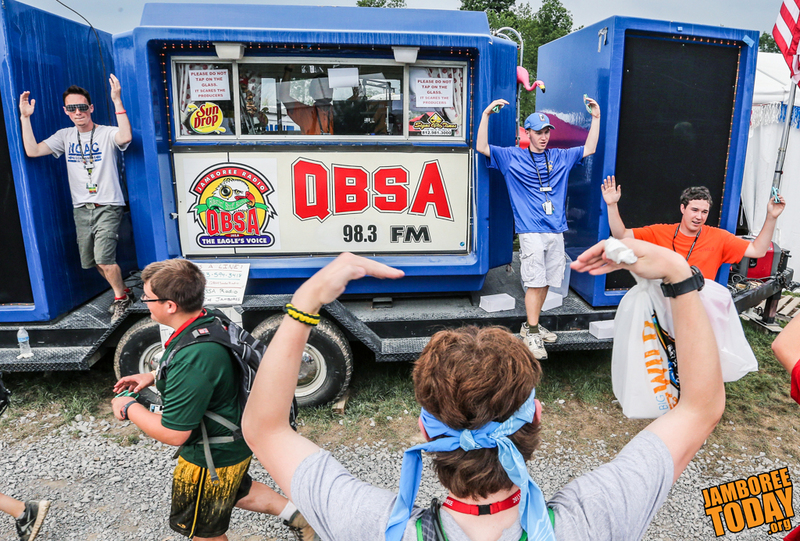 At the 2013 jamboree, listeners could tune into QBSA on the TuneIn radio app, available on smartphones, as well as on the web. QBSA's new location at 2013 jamboree was in the eastern part of Summit Center, just south of the CONSOL Energy Bridge. Scouts and Venturers who didn't have a chance to beam their voices out from the QBSA studio are encouraged to plan to come back to the Summit for the 2017 National Scout Jamboree.